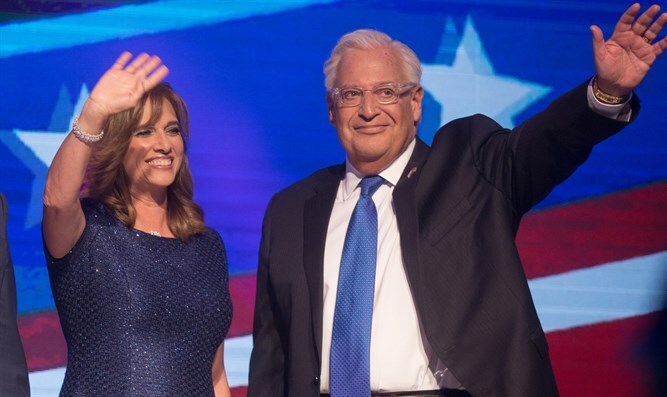 US Ambassador David Friedman and his wife Tammy hosted a toast to the Jewish New Year attended by dignitaries and press at the US Embassy in Jerusalem. At the event, the Ambassador spoke of achievements in the past year and the ever strengthening ties between the two countries. "As to each of our personal soul-searching, I'll leave that to everyone's individual conscience and individual desire. I'll just wish everyone, including myself, an opportunity to engage in a meaningful experience of self-reflection, of growth, and of improvement. "Thank G-d, the relationship between our two countries, between the United States and Israel is on solid ground, and I would argue more solid ground than ever before." "Thanks to the courageous and historic decision of President Trump to exit the Iran nuclear deal, we're beginning to see encouraging signs that the Iranian enterprise, the world's principal state sponsor of terrorism and an enemy that publicly avows to destroy the State of Israel, is under extraordinary pressure. Is it defeated? Most certainly, most certainly not yet. But with every day there's a growing basis for optimism. The pressure on Iran will continue to mount, and I'm confident that this enemy, the great challenge of our generation, will enter the dustbin of history among all the evildoers who have threatened the United States and Israel in the past."